Could this incredible bot be the next big Twitter thing? @NolanFeeney Surprised to see Case album. It’s fun to scroll down the feed, and see the mood and capitalization and style of Tofu Product’s tweets change. Based off his tweets, musician and developer Joe Toscano seems to have made the bot. Two things strike me about Tofu Product. First, it is fast. Between my first @-reply greeting to it and its first imitation of me, only six seconds elapsed. Six seconds to trigger the script, to search my feed, to send a tweet. It’s rare to see an auto-responding bot this fast, and, simultaneously, that speed makes it clear that @tofu_product is a bot, because no human could be that good. 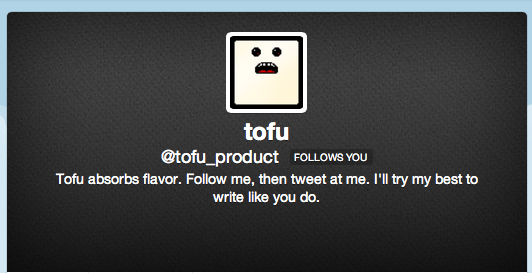 Second, @Tofu_Product is kinda delightful. Every tweet from it, to you or a friend, triggers a little thrill of recognition. “I remember using that word!,” or “He would tweet that!,” etc. Tofu avoids the Uncanny Valley, by virtue of its output—they’re not sentences, just strings of text. But it’s a bot singing your song, or your friend’s song, and smiling all the while. In its very bot-iness, it is a bot pleased, productive, and personalized.